NEW YORK, November 4, 2013  The best high school and university marching bands and the nation's top performance groups will shine side-by-side to dazzle the crowd at the 87th Annual Macy's Thanksgiving Day Parade. More than 3.5 million spectators and 50 million viewers nationwide will watch as the performers strut their way into the holiday season, bringing the magic of Macy's along for the ride. The 2013 parade steps off at 9:00 AM on Thursday, November 28. In addition to being an entertaining spectacle, the musical performances showcase a diversity of creative talent that truly represent the very best of local communities. Returning units such as the Macy's Great American Marching Band, Spirit of America Dance and Varsity Spirit Cheer will be joined by first-time performance groups South Shore Drill Team and All That! to bring a diverse selection of music, dance and dramatics to this year's festivities. 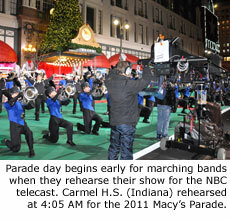 For the marching bands, their Macy's Thanksgiving Day Parade journey began more than 18 months ago, when band members were surprised at their schools with an invite to participate in the 2013 Parade by the Macy's Parade Band Committee. Selection into the Macy's Parade was based on submitted videos of past performances, awards, national recognition, letters of recommendation and of course each band's unique personality to captivate an audience. As confetti filled the air and cheers of delight echoed throughout the auditorium, each group took their invite to perform in the Macy's Parade as a pinnacle in their performing career. Since their selection, the marching bands and performance groups have been busy perfecting their skills and helping to raise funds for their once in a lifetime trip to New York City. Showing their creative side, groups have developed interesting and exciting fundraising initiatives in their community. Corporations and philanthropic members of the community have been willing to help their hometown school but students have also thought outside the box to raise the funding. From selling candles and mattresses to homemade salsa sales, students have taken a variety of routes to make their dreams a reality. Musical Selection: "Journey to the Center of the Mind"
Musical Selection: "A Copeland Fantasy"
Musical Selection: "My Favorite Things"
Musical Selection: "Sonoran Desert Holiday"
Musical Selection: "The Wizard of Oz Medley"
Musical Selection: "An American Reunion"
Musical Selection: "Strike Up The Band"
Musical Selection: "Big Noise From Winnetka"
Routine: "I Need Your Love"
Further information on the Macy's Thanksgiving Day Parade can be obtained by calling the Parade Hotline at (212) 494-4495 or by visiting www.macys.com/parade. See more information on Marching.com about the Macy's Thanksgiving Day Parade and view the 2013 Macy's Parade route map and list of entries. Text and logo courtesy of Macy's Thanksgiving Day Parade. Photo by Marching.com.